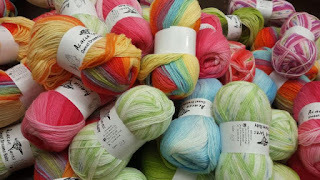 Yarn and Fiber Happenings: Superbowl Sale All Weekend and the Sleepy Eyes Knits Dreamscape Trunk Show is Coming February 13th! Superbowl Sale All Weekend and the Sleepy Eyes Knits Dreamscape Trunk Show is Coming February 13th! Hello all Superbowl Fans and Fans of Sales during the Superbowl! We are hosting our first ever Superbowl Sale both instore and online! Receive 15% Off MSRP on all online and instore purchases over $50 on all in-stock yarns and products with the following coupon code - SUPERBOWL. To receive the sale price, put at least $50 of merchandise in your shopping cart and then at checkout, please enter the following code in the coupon box to receive your discount! The coupon code is SUPERBOWL. Sale begins Saturday February 6 at 12:00 AM and runs through February 7th at Midnight (EST). Also please made a note to join us for the Sleepy Eyes Knits Dreamscape Trunk Show and Book Signing with Gina House on Saturday, February 13, 2010 from 11:00 AM to 3:00 PM. This is a fabulous book filled with original designs that classic and simply constructed and use each design calls for 1 or 2 skeins of yarn. The spiral bound book includes pattern charts and vintage style photography as well as clear and easy to follow instructions. Samples from the book will be available for try on so you can decide which one you'd like to start knitting first! And as a bonus for coming to the show, each signed book purchased on Saturday instore, will also include a PDF of the Dreamscape book with the spiral bound book. Can't make the show? Order one online and we can ship to you (book only, sorry PDF not available for online purchase). Make sure you sign up for a chance to be our next lucky winner for our Prize Giveaway. It's easy! Just go to our website click on the Prize Giveaway link on the right hand margin and enter your info! Good luck to all who have entered! We are waiting to hear from our January winner and will post a new giveaway soon! Please note regarding sale items: Discounts apply to instock merchandise only. In the unlikely event that an item is out of stock (when it shouldn't be) we will remove this item from your order and a refund will be made. No other discounts can be applied.